Metal Gear Solid on PC. Metal Gear Solid on PC. Metal Gear Solid. On PC. It’s been bloody ages since the adventures of Snake graced our platform, and Big Boss never had the opportunity, so these are exciting times. 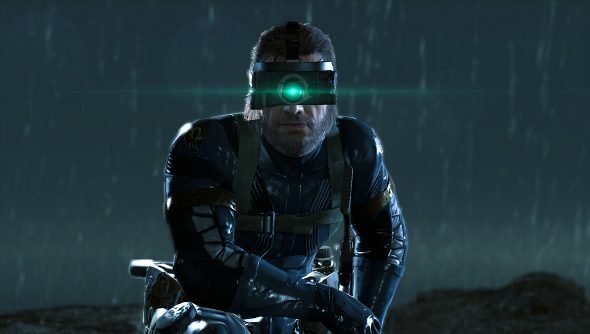 Metal Gear Solid V: Ground Zeroes finally launched on PC last night, and I’ve been faffing around in the rain for a wee while now. 2003, that was the last time we got to play the series. It was Metal Gear Solid 2: Substance. 11 years is a long time to go without. We did get a decent port of the ridiculously titled Metal Gear Rising: Revengeance, though. So it wasn’t absurd optimism that had me hoping that Ground Zeroes would be at least serviceable. The good news is that it’s not just serviceable. Ground Zeroes is a pretty game. From the first moment you get to gaze on Solid Snake’s clone daddy, Big Boss/Snake, and his taught bottom, it’s striking. 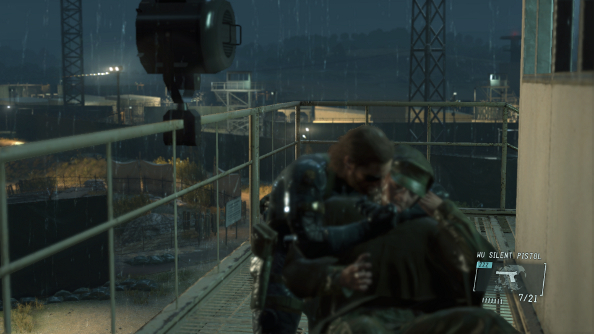 It’s also wet and windy, and the rain pelts Big Boss constantly, while the wind tousles his hair and plays with the bulky raincoats of the armed guards. How lovely it looks for you will, of course, depend on your rig. Ground Zeroes is far from demanding, though. A GTX 760 and an i7-4790 is recommended, but there’s plenty of wiggle room. 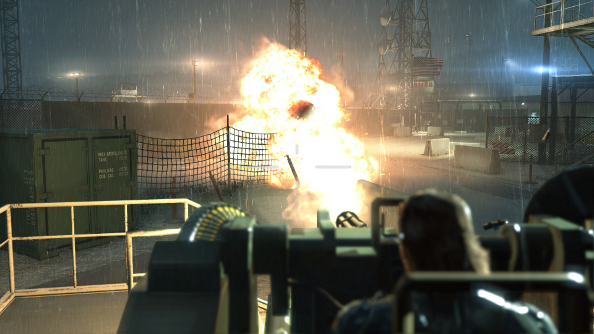 It’s well worth delving into the options, because Ground Zeroes doesn’t have graphics presets. While they would be convenient, I can’t remember the last time that I was content with a preset. Tinkering is one of the joys of owning a PC. The graphics options are neither terrible or remarkable. Model detail, texture quality, texture filtering, shadows, lighting, screen filtering, SSAO and effects can be fiddled with, with most of them coming in low, medium, high and extra high. Subtract a setting or two depending on the specific option. Selecting each option brings up a woefully inadequate text description, as well. 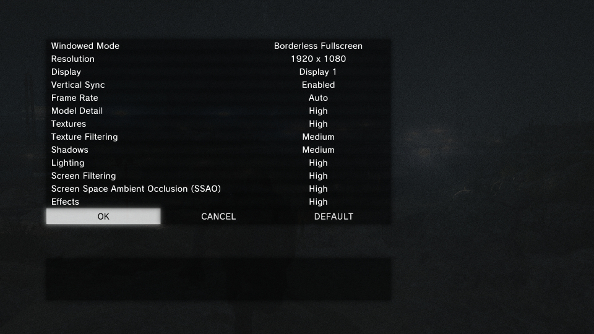 What’s a bit peculiar about Ground Zeroes’ graphics options is that the list looks a lot smaller than it actually is. Take screen filtering, for instance. This bundles a whole bunch of post-processing features into one option. So what you’re changing is depth of field, bloom, anti-aliasing and screen space reflections. It’s a bit of a pain, because it means that, from this menu at least, you’re unable to apply post-process anti-aliasing, which is activated with the high setting, without first activating bloom and DoF, which come with the low setting. So it’s eccentric, but the result is still a good-looking game that offers a significant improvement over the console versions. With everything maxed out and vsync on, I had no problems whatsoever. The game ran at an average of 54fps, with a high of 60 and a low of 48. It was generally very consistent, and without the counter on, I was unable to notice any fluctuations. Turning things down a notch to high ensured a constant frame rate of 60 with no dips at all. The most noticeable effect was with the lighting. 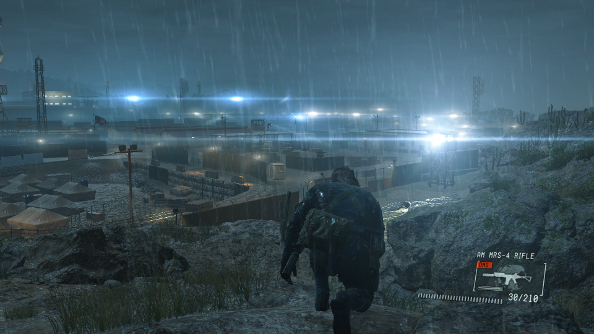 The big benefit of playing Ground Zeroes on PC is that things like lighting are no longer limited by console hardware, and more lights that appear further away can be found on the PC version. But on high, the difference is less dramatic, with less deferred lights present. On medium and low, the absence of many of the post-processing effect and, again, the difference in lighting and shadow quality has quite the impact. It’s worth noting, however, that even on these lower settings, there are still a lot of high beam spotlights and a lot of lense flare, which is more obvious in the below images because the light is shining directly at Snake, unlike those above. It’s a good thing too, since knowing where these spotlights are and when they are looking directly at you is key to Big Boss’ infiltration. The rest of the options are exactly what you’d want from a precise stealth game. Aim assist can be switched on or off and UI elements like indicators and markers can be turned off, but it’s the camera that gets the most attention. Both the X and Y axis can be inversed, camera speed for third person, first person and over the shoulder views can be adjusted, as can the speed at which the camera switches views. Camera shake can be turned off, too. Ground Zeroes supports both mouse and keyboard as well as controllers, and both are completely viable. Mouse and keyboard is a bit more precise when it comes to shooting, and the keys can be rebinded, while controllers are stuck with presets. There are a few of them, at least. I did feel more comfortable with the controller, though. Some of that was really because it was just what I was used to when playing an MGS game. But when using a controller, it just feels like you’re playing it the way Kojima intended. The sensitivity of the analog stick, for example, can’t be mimicked with a keyboard. Sneaking just feels a bit more natural with a controller. 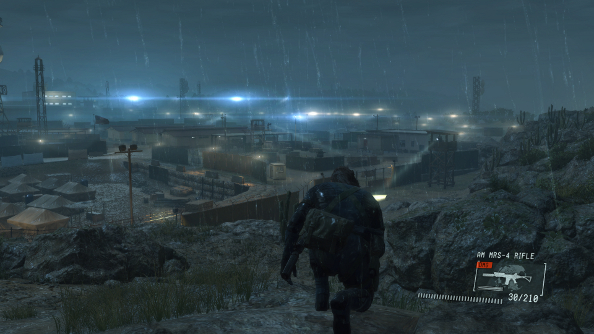 Snake’s infiltration of a damp prison is pretty short. It can be completed in 20 minutes. But that misses the point, a bit. It’s a sandbox, a place to experiment and play, with a map that’s tactically interesting. It’s evocative of some of the best bits of previous MGS games and the murderous playgrounds of Hitman: Blood Money. If you want a wee bit more than that, though, then the PC version has you covered. The Xbox and PlayStation versions came with a fancy unlockable bonus mission each. On PC, we get both of them. One’s a nostalgic flashback to the Shadow Moses incident, from Metal Gear Solid, while the other gives you control of cyborg Raiden from Revengeance, as he hunts down aliens. 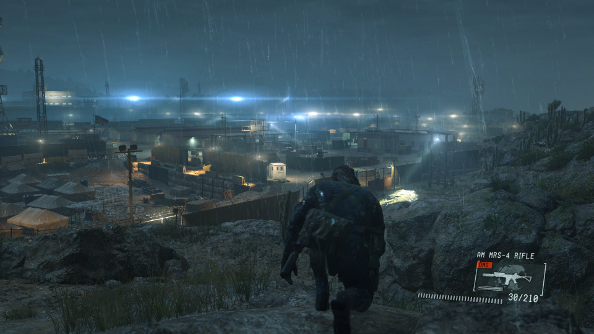 While the graphics options leave a little to be desired, Ground Zeroes feels right at home on PC. Unless you desperately want to play it on your big telly, and your PC setup doesn’t make that possible, this is the version you should get. Come on, you know you want to see all those pretty lights bounce off Snake’s derrière.